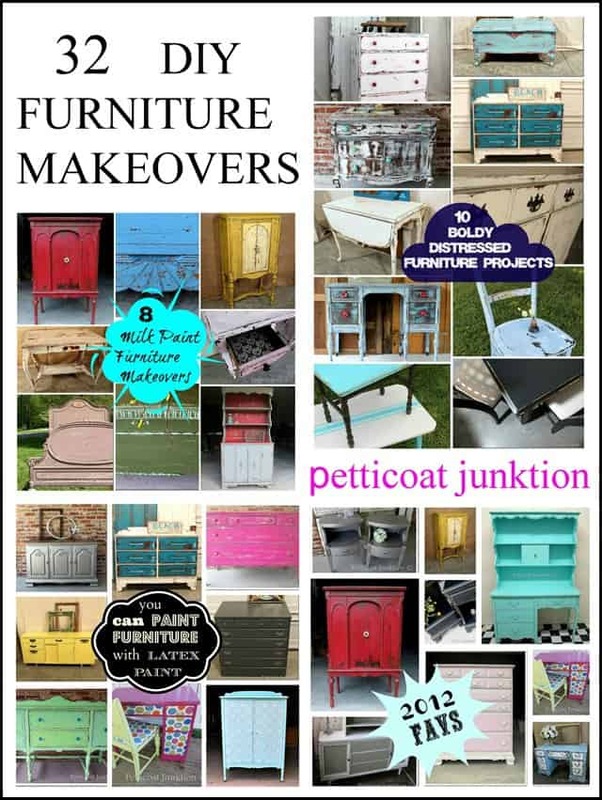 These top DIY furniture makeovers give you a look at a variety of furniture paints . The painted furniture makeovers also include my favorite special paint techniques. Just looking at photos of the makeovers make me smile. I put a lot of time and effort into these paint projects. They are my babies. I love reading emails and comments from you guys, keep them coming. Some of you are scared to pick up a paint brush and start a furniture project. Just do it. Nothing ever happens if you sit on your hands. I wish I could be there to hold your help you. The best I can do is try to give you tips and tricks in my paint tutorials. I hope I help in some small way. Let’s start looking at a few projects and if you have any questions send me an email. The gray and red cabinet is a sweet favorite. I love the color combination. I painted the cabinet as a display for Miss Mustard Seed’s Milk Paint….and of course it’s painted with MMSMP. The colors in the milk paint line are beautiful. I used to be a retailer for the milk paint but I got a little overwhelmed with everything and had to let a few things go. The milk paint was one of them. Click here to see the detailed tutorial and more photos….Gray and Red Country Cabinet. 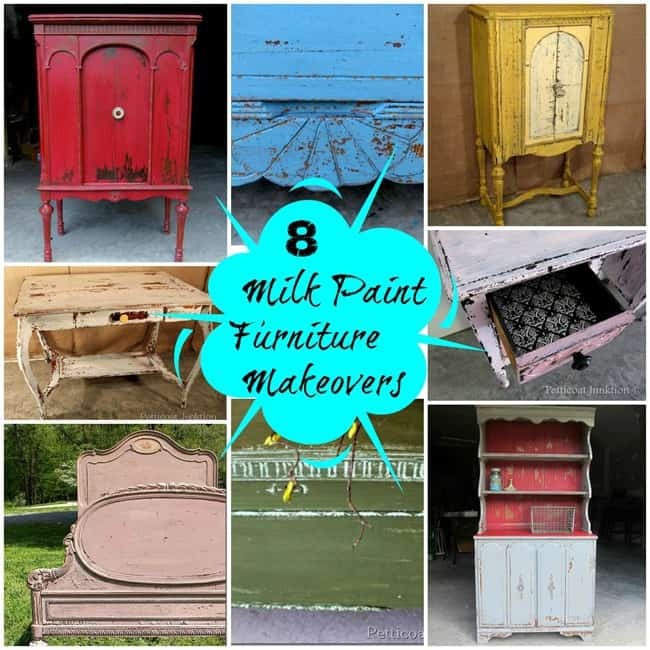 Milk paint is one of my favorite specialty paints for furniture. Miss Mustard Seed’s Milk Paint was the first milk paint I tried and I just love it. The chippy finish the paint produces is very authentic looking, just like the piece was painted ages ago and chipped naturally. Latex paint is great. I don’t know why so many people pooh pooh it when furniture is mentioned. Latex paint is a go to for me when choosing the perfect paint for a makeover. You can get it mixed in any color for one thing! The color choice for the boys bedroom suite was just right. The hardware is painted with gray primer spray paint. 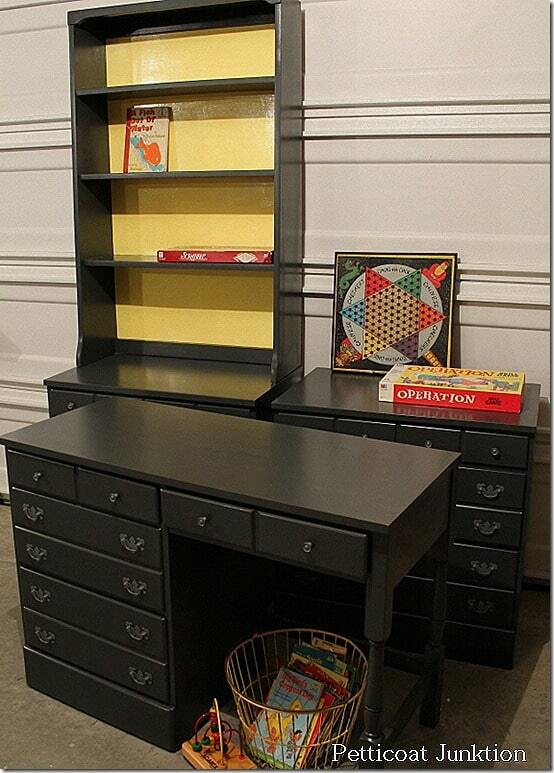 See all the details here…..Gray Furniture For Boys. 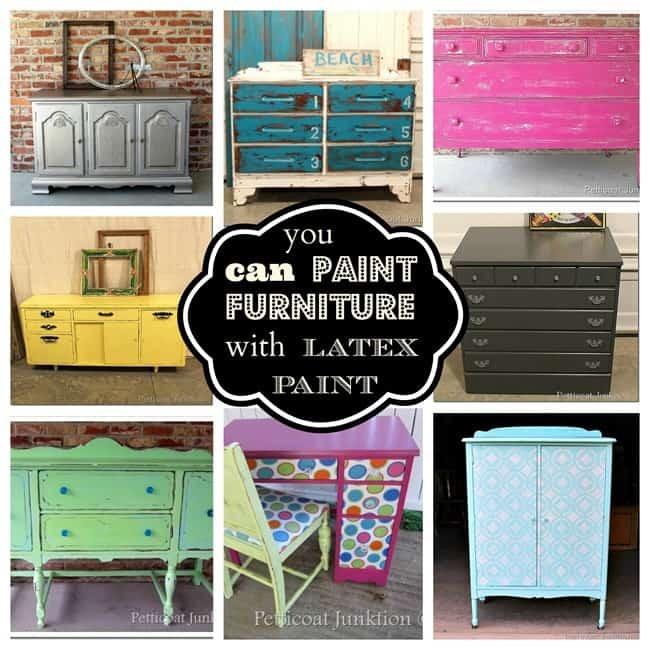 See the furniture projects painted with Latex Paint by clicking here. Latex paint comes in every color imaginable. You can also find oops paint at hardware and paint stores for a fraction of the original price. The oops paint is a color mixed for a customer and the customer decided the color wasn’t for them. It’s a win-win for us thrifty people. Usually I can pick up a qt. for $5 and a Gallon for around $8. When I use latex paint I often prime the piece before painting. It isn’t always necessary but it makes for a smoother, uniform color surface for your top coat. When it comes to distressed furniture it’s not hard to pick my favorite. It is the over-the-top controversial dresser shown in the photo below. Boy, did I stir up some controversy with this piece. It looks really busy against that brick wall but in person it was a stunner. Photos don’t always show the furniture in it’s best light. I’m not a pro at photography. I wish I still had the little dresser. 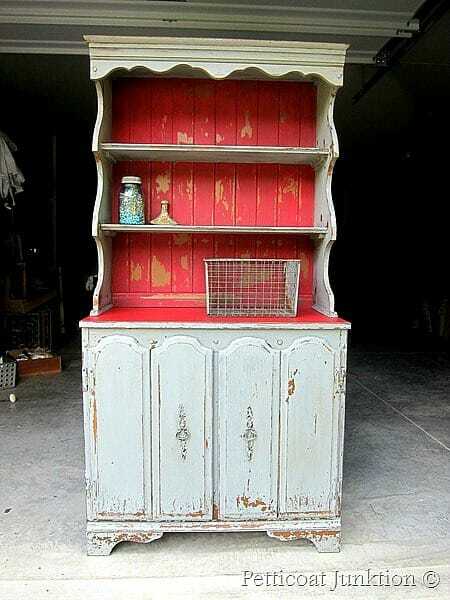 I bought the antique dresser at the Nashville Flea Market and you can see it here…..Shabby White Dresser. I’m known as the “Queen of Distressing”. I like everything from minimal distressing to over-the-top heavy distressing. I know the look isn’t for everyone….that’s okay. Sometimes I use a sander to do the distressing and sometimes I do it by hand. You have more control when using sandpaper by hand but if you want to go all out with the distressing then go for the electric sander. The furniture piece often dictates the type of makeover. 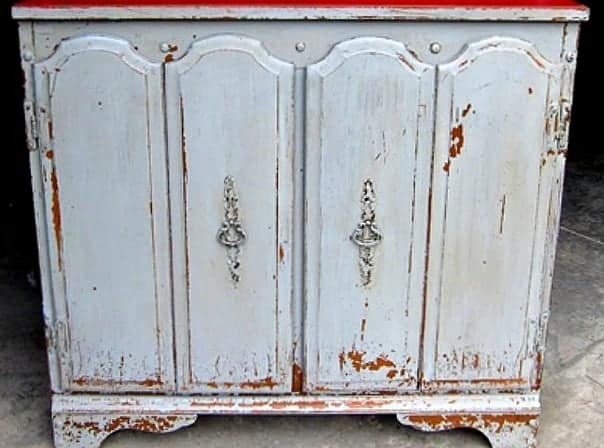 If the furniture is heavily detailed or if the finish is marred by dings, dents, and missing veneer it is the perfect project for distressed paint. 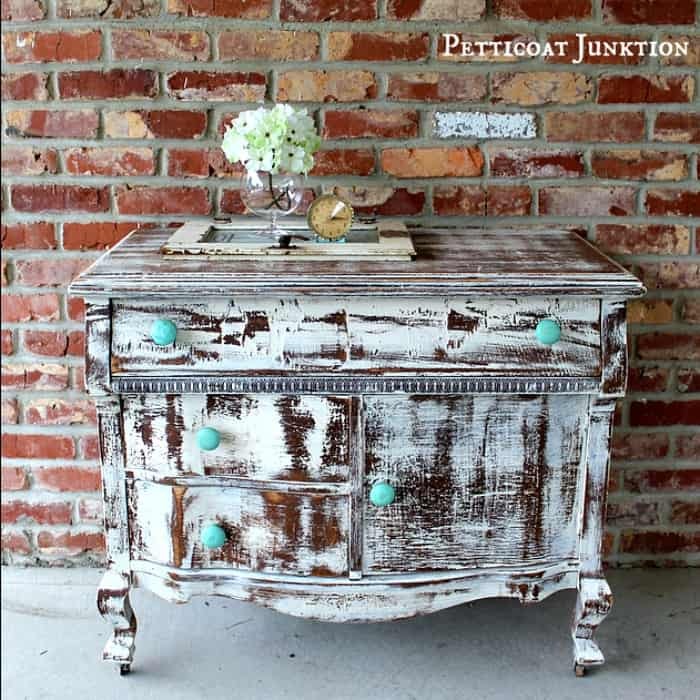 All of the details and imperfections pop when distressed giving the paint depth and character. 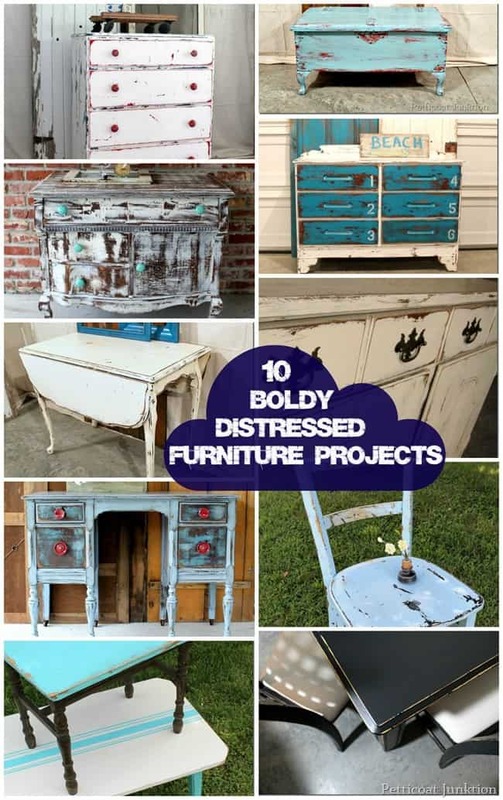 Get a look at the distressed furniture here. 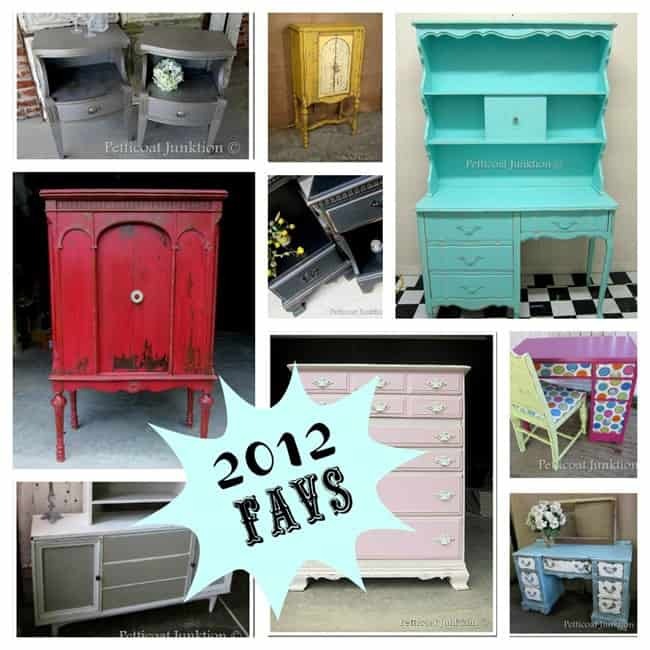 The diy furniture makeovers pictured above are the favs from 2012. (seems like just yesterday when I painted them) Some of the makeovers still top the list in 2018. I forget how much I enjoyed working on the older projects. For instance that desk with the decoupaged circle fabric was a hot mess to begin with but it turned out better than I expected. Get a look at these 2012 favorites by clicking here. Update on my Dad – After 11 days in the hospital following emergency surgery for a ruptured appendix we moved him to rehab yesterday. He is in the same nursing home as Mom but not the same room. We didn’t want her routine to be disrupted or Dad to worry about Mom instead of himself. They had dinner together in the dining room last night and he can wheel down the hall in his wheelchair or use his walker to visit with her. It’s so difficult seeing your parents go through rough times. I’m just thankful for the caregivers and my brother and sister. It takes everyone working together to care for our parents. I hope you enjoyed the stroll through some fan favorites and also a few of my favorites. What is your favorite paint? Have you picked up the paint brush yet or do you still have qualms? You can always email me. Remember you can click any of the pink text links above to view the post and links to tutorials. Find my favorite paint supplies and tools on the Petticoat Junktion Amazon Page here. Seeing them all here I am reminded why I love your work so much – you dare to step outside of the box with color and techniques! Wow! So talented and artistic. Not afraid of color…I looove it! My thoughts and best wishes are with you and your family right now, too. Love looking at all your finish projects, wish I had your energy. is there a good website to purchase dresser hardware like drawer pulls and handles? Je voudrais décaper et revernir en plus clair un petit meuble,je voudrais des conseils. Merçi pour la réponse. THE most helpful blog out there!!! I have MUCH desire to do these furniture projects however I am very ill. I have the pieces I need to work on but haven’t the strength to DO them. These tips may be exactly what I needed to finally (after a year and a half) be able to complete at LEAST some of more prominent ones. Having them completed will brighten AND LIVEN up my family room where I spend 90% of every day. You have made it soooo much easier than I ever dreamed it would be. THANK YOU!!! I will send pics when/if I complete any. I have a dresser for master bath, a console to use for TV. A coffee table, and several smaller tables and a few chairs. All are antique and NEEEEEEDDDDDD to be brightened/livened up. Thank you again!!! I don’t have a website yet but would still like to tell you that I enjoy all your blogs and tutorials! You are a very talented lady! 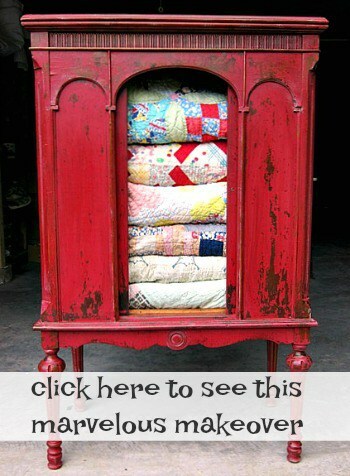 I love doing DYI projects and more than that going to junk stores! I have a drop leaf table that has Formica top that looks like maple and matches legs. Can this milk paint be used on it? Thanks. I just love all of your postings! Haven’t been following you that long, but I’m always excited to see your site pop up on my e-mail. Thank you for sharing your creativeness & talent with us! I’ve “borrowed” many of your projects!!! Hello there, this is great . 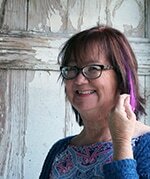 In February, I am restarting my Greeny Crafter series where I feature lovely makers who upcycle. I was wondering whether you would like to be featured. Send me an email at greenissuessg (at) gmail (dot) com Thanks! Great projects, love all the colors! 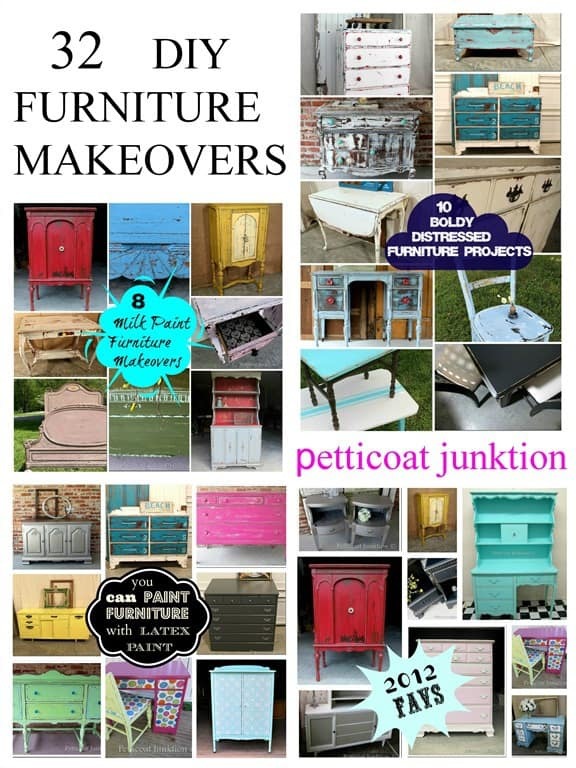 So many fabulous furniture makeovers! Love them all. Kathy, I could never be as bold as you with distressing, but I love the painted furniture, especially the tourquoise hutch/desk. I love that you aren’t afraid of color and use it as a major statement.